you can't fool me anymore lady, I AM SO ON TO YOU. jekyll to her hyde. mother theresa to her nancy spungen. hillary duff to her lindsay lohan. ANGIE, the saint, makes babies and movies and saves countries and wears a bun and conservative sweaters to conceal the monster rack. until i see them in the same room together...nancy drew here is sticking with her story. i'm a bit confused on that one. 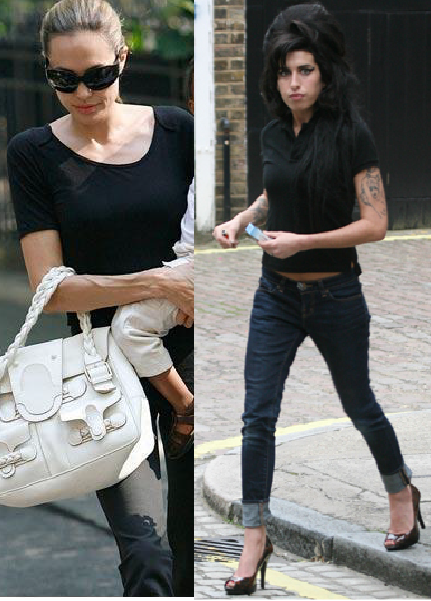 i think winehouse is corpse bride and jolie is bono.